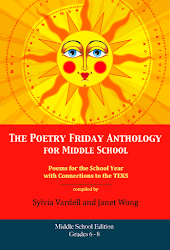 Over at our blog promoting our new middle school book, The Poetry Friday Anthology (Gr. 6-8), I'm posting "poem movies" that my graduate students have created for selected poems from the anthology. Look here. Each student chose one poem from the anthology and then interpreted it in a short, original, one-minute digital film-- sometimes with input from young people themselves (and with the poet's permission, of course). I'll be posting one-a-day throughout April (National Poetry Month). Meanwhile, a former student, Carol Neeland, has done the same thing with her students at the international school at The Hague where she works. Her students were kind enough to share one of their videos with me and I am posting it below. Check it out! I love the idea of using technology to engage in poetry. And since I'm such a movie buff too, I love the idea of using filmmaking to interpret a poem. Sixth graders at the American School of The Hague in The Netherlands take an eight week IT skills course with Carol Neeland, middle school IT teacher and graduate of TWU's School of Library and Information Studies program. One of the units in the course is "Green Screen Poetry" and the guiding question is, "How can technology be used to promote communication, collaboration, and creativity?" During this two week section of the course, students learn basic video production techniques while making creative interpretations of poems for young people. They work in groups to develop a collaborative storyboard on Google Docs that includes the lines of the poem, the photographs they will use in the background of their green screen scenes, and the actions they will do in front of the green screen to bring the poem to life. Students operate the lights, cameras and clapperboard, edit the video using the green screen effect in iMovie, dub in voiceovers, and make subtitles showing the original text of the poem. Using Garageband loops, the kids create music that expresses the mood of their poem. They play the music during the credits which cite the sources for their background photos in addition to acknowledging everyone in the room who helped with the production. Through the green screen poetry project, Mrs. Neeland and her students combine a passion for poetry with the craft of video production and this unique combination can be magical for sixth grade students! BTW: I'll be posting daily in April here, too. (The poem movies will be at the PFAMS blog.) Here, I'll be featuring "Blasts from the Poetry Past," snippets that look backward at the history of poetry for young people. I hope you'll stop by! 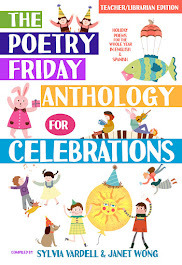 Now, let's gather at A Year of Reading for some Poetry Friday fun hosted by the lovely Mary Lee Hahn. See you there! Posting by Sylvia M. Vardell © 2013. Video: Carol Neeland. All rights reserved. What's the deal with this Amy Ludwig VanDerwater? 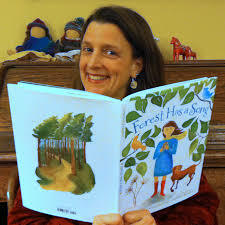 I am so excited to join the throng celebrating the release of Amy's first book of poetry for children, Forest Has a Song. It's a beautifully designed picture book in which the gentle watercolor paintings (by Robbin Gourley), the layout of poem and painting on each page, and even the spidery font of the text work together to create a poetry collection that is inviting and comforting at the same time. Kirkus Reviews called it "fresh and original" and I agree. It's a quiet book, perfect for sharing at laptime or with a whole class as you pause to look out the window or examine a leaf. The natural world has been the topic of poetry for young people for ages-- and for good reason-- and Amy really taps into the child's connection with the simplest details-- pinecones and sticks, footprints and birds flying. Her poetry offers many tactile details that will invite children to touch, smell, and see the world outside their iPads in tangible ways. I also appreciate how she offers a variety of poetic forms and layouts so children (and teachers) can see how poets use the words and space on the page (a Common Core element, too). I particularly love Amy's use of rhyme-- making it look so natural, too-- as if we all spoke in lyrical language when captured by the beauty of the forest. I live in the city and don't spend much time in woodsy woods, but I felt more alert to the wind this morning and to the cardinal in the tree outside my house because this book was on my mind. Don't miss this debut work by a promising poet. My favorite poem in the book? 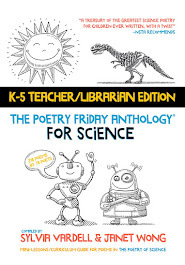 Full disclosure: Amy is also one of the poets featured in The Poetry Friday Anthology (both for K-5 and for grades 6-8), so I am already a big fan of her work. Her first stand-alone book is something very special to celebrate! And be sure to check out her very meaty website and blog, too. I am also thrilled to announce that in my prescience I arranged to have Amy on two of my presentation panels this spring. Am I psychic (and lucky!) or what? I am presenting with Amy at the International Reading Association on Monday, April 22 (11:00am-12:00pm) along with Joyce Sidman and Janet Wong. What a wonderful group, don't you think? Our topic is "Celebrating Poetry and Common Core Curriculum Connections." We'll show how subversive poets can be about inspiring readers while covering standards. THEN, Amy will be one of the poets coming to the Texas Library Association conference and will be presenting in my annual Poetry Round Up (Friday, April 26, 4:00-4:50pm), as well as be part of the poet panel at P*CON, the post-conference poetry institute (Saturday, April 27, 10:00-1:30). Other participating poets (also wonderful people, of course!) include: Sara Holbrook, Michael Salinger, Charles Waters, Jane Yolen, Rebecca Kai Dotlich, Robert Paul Weston, and Guadalupe Garcia McCall. What a line up, right? April is going to be busy, but it always is for us poetry-lovers. Let's revel in National Poetry Month-- and see if we can't convert a few others to join us! 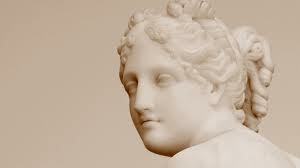 Post by Sylvia M. Vardell c 2013. All rights reserved. 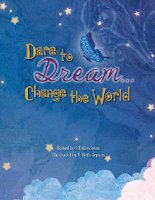 Jill Corcoran, compiler and contributing poet to the award-winning Dare to Dream … Change the World, a children’s collection of biographical and inspirational poems, has announced the Dare to Dream … Change the World Annual Writing Contest for Kids. The grand-prize winner will receive $1500 worth of books for a school or public library of their choice. The top thirty entries will be published as a free e-book by Kane Miller Books. Recently released by Kane Miller Books and illustrated by J. Beth Jepson, Dare to Dream … Change the World features work from thirty renowned contemporary children’s poets, including J. Patrick Lewis, current Children’s Poetry Laureate. 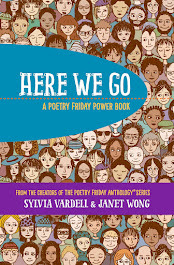 Each pair of poems in this anthology was inspired by someone whose actions made a difference, not only in their own lives, but in the lives of people all over the world. Subjects form a culturally diverse mix ranging from Jonas Salk to Steven Spielberg, from Christa McAuliffe to Michelle Kwan, with brief descriptions of their lives included. Poems by Jill Corcoran and Bruce Coville frame the biographical-inspired pieces. This contest “aims to promote literacy, poetry writing, and nonfiction research while inspiring students to follow their own dreams.” Following the format of the book, students in the third through eighth grade are invited to send a biographical poem together with a non-fiction paragraph about someone who not only dreamed, but took action and made the world better. Official rules can be found at daretodreamchangetheworld.com. 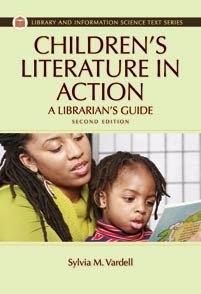 A free, downloadable curriculum guide for the book is also available both on the contest website and at kanemiller.com. Be sure to include your first name only, your e-mail address and your parents’ e-mail address. WINNER receives $1500 worth of books for a library of their choice. TOP 30 ENTRIES will be published as an e-book. Fellow Texan Guadalupe Garcia McCall is raking in the awards this season. She was recently named a Lee Bennett Hopkins “Promising Poet!” The Lee Bennett Hopkins Promising Poet Award was established by Hopkins along with the International Reading Association in 1995 to encourage new poets in their writing. These poets have only published two books (to qualify for the award), but their work has already been judged to be of high quality. The award is given every three years. Congratulations, Guadalupe! Previous recipients include. Neri, Gregory. 2009. Chess Rumble. New York: Lee & Low Books. Johnson, Lindsay Lee. 2002. Soul Moon Soup. Asheville, NC: Front Street. George, Kristine O’Connell. 1997. The Great Frog Race and Other Poems. New York: Clarion. Chandra, Deborah. 1993. Rich Lizard and Other Poems. New York: Farrar, Straus & Giroux. 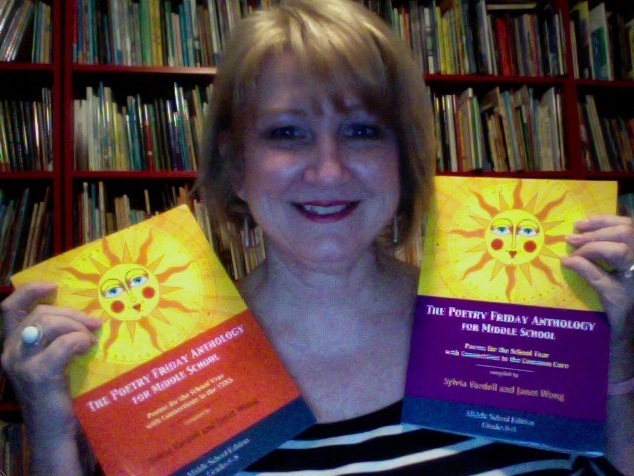 For more information, check out my resource book, The Poetry Teacher’s Book of Lists. 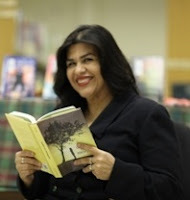 In addition, her debut novel (in verse), Under the Mesquite, was also named a Tomás Rivera Mexican American Children’s Book Award recipient—an award that doesn’t necessarily go to a work of poetry. It’s given by the Texas State University College of Education which established the award in 1995 to honor authors and illustrators who create literature that depicts the Mexican American experience. The award was named in honor of Dr. Tomas Rivera, a distinguished alumnus of Texas State University. For more information, look here. 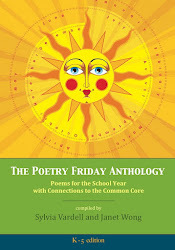 Of course, I'm also very proud to brag that Guadalupe is a contributor to our Poetry Friday anthologies, too! 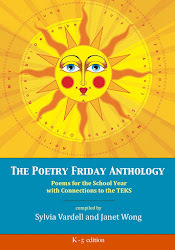 Her powerful poems, “The Bully,” "Bailes," and “Doña Pepita” appear in The Poetry Friday Anthology for K-5 and “The Café” and “The Boy” appear in The Poetry Friday Anthology for Middle School. For more details, go here. Guadalupe will also be speaking at the upcoming post-conference poetry institute (P*CON) at the Texas Library Association conference next month in Fort Worth—along with Amy Ludwig VanDerwater, Charles Waters, Jane Yolen, Michael Salinger, Rebecca Kai Dotlich, Robert Paul Weston, Sara Holbrook, and Will Richey (and teens). An amazing line up, right? I'll be sharing more info about that event along with my ninth annual Poetry Round Up very soon. Posting by Sylvia M. Vardell © 2013. All rights reserved. 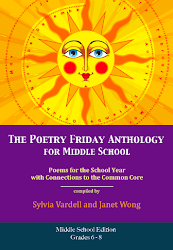 Poetry Friday Anthology for MIDDLE SCHOOL launches today! 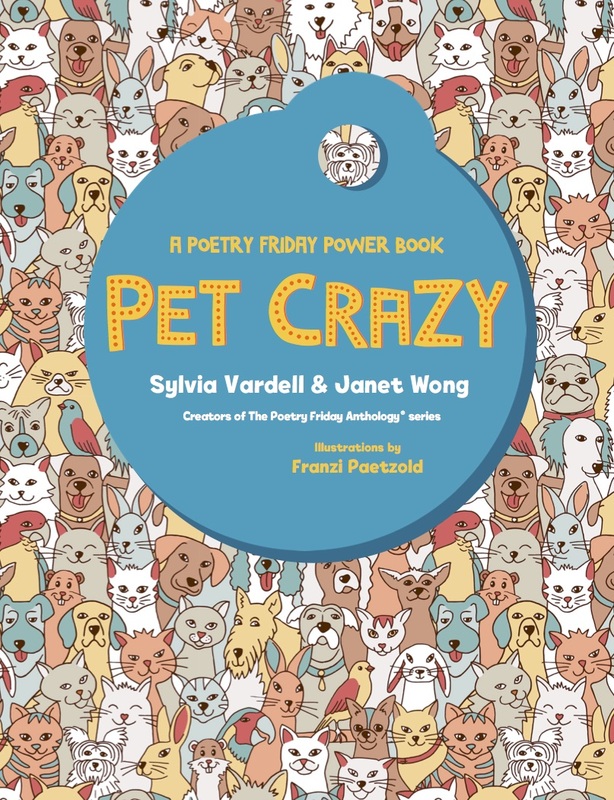 I’m pleased as punch to announce a new poetry collaboration with my amazing poet colleague, Janet Wong. 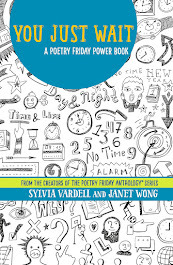 It’s The Poetry Friday Anthology for Middle School (grades 6-8), officially available today! (The purple version on the right features the Common Core poetry standards and the red version on the left features the TEKS standards in Texas.) We’re so proud to showcase 110 never-before-published poems by 71 of the best poets writing for tweens and teens today. You’ll find heaps of information at our book blog here including links to ALL the poets in the book and details on our book giveaway contest! What? A free book?! YES! Want the book now? Details here. connect with relevant web sites like the CloudAppreciationSociety, Video.NationalGeographic, VoiceThread, IMDB, Census.gov, HowStuffWorks, TromboneExcerpts.org, HealthyPet, SI.edu (Smithsonian), SoundCloud, Photography.NationalGeographic, Howcast, AllPosters, and Shorpy. Each of these activities helps highlight poetry skills from the standards such as the use of hyperbole, repetition, sensory language, alliteration, metaphors, personification, internal rhyme, line breaks, and more. 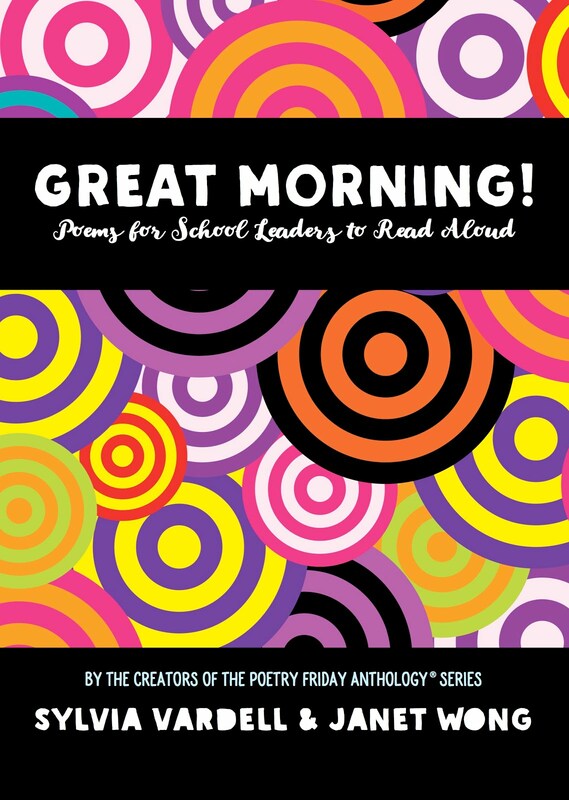 I hope you’ll check it out and help us spread the word to all middle school teachers, librarians, students, and parents of students—just in time for National Poetry Month (in April). Buy the book (in paperback and/or e-book form) from Pomelo Books here. And let us know what you think!